This waterfall is situated in the Khao Phra Thaeo National Park. The fall is quite small but during the rainy season a great volume of water pours down it. The park headquarter and a small restaurant with an excellent view are also at Ton Sai. The waterfall, nearby pools, and the jungle setting are a lovely scene. Directions: Turn east at the traffic lights at Thalang town (22 kms north of Phuket town on route 402), and proceed for about 6km through rubber plantations following the sign for Khao Pra town. Bang Pae waterfall is close to the Gibbon Preservation project location on the east side of Khao Phra Thaeo National Park. It is a small waterfall within a shady forest and surrounded by thick foliage. The walk to the waterfall is not recommended for people with handicaps. The waterfall has a drop of some 20m before cascading down to a 500m rocky stream with pools for swimming. If you are lucky you may catch a glimpse of some wildlife such as wild boars, porcupines, mouse deer, crabs, and birds. A very small dam has been built downstream for irrigation and agricultural purpose. Directions: Head east, from the Two Heroines Monument, along the Pa Khlok road. Proceed for some 7km and look for the posted signs on the left. The Kathu waterfall is a pleasant cooling location for a picnic and an afternoon swim. It is set among the mountains of Khao Kamala (Kathu side). The waterfall is at its best in the rainy season (July to Novemeber) and dwindles to only a trickle in the dry season of March through May. Steps will take you to the lower levels and views of the fall at 200m. Additional steps have been cut into the hillside to enable one to reach the higher levels, where there are tables and benches close to the pools. Thereafter there are many little safe paths by which one can explore the preserved forest. Directions: Proceed out of Patong, and over the hill, on the main road towards Phuket town. Turn left at the first intersection, and turn left again after 1.5km (near the Loch Palm golf course); then continue for a further 2km. The Phuket Waterski Cableways park is also nearby. Kao Rang offers an excellent view of Phuket town, the southern part of the island (to Chalong) and some of the offshore islands. Kao Rang Hill is situated on the north west of Phuket city. There are also a few restaurants with views, a health park for exercise enthusiasts and a comfortable expanse of grass for picnickers at the top with a bronze statue of Phraya Ratsada Nupradit the model Governor of Phuket during King Rama V's reign. This is also one of Phuket's famous and best views, situated between Kata and Nai Harn. The sunsets are especially spectacular. From this point one can see the bays of Kata Noi, Kata Yai, and Karon, and also Koh Poo Island. There is a large public sala for visitors, and several vendors sell food, drinks, and souvenirs. Without wishing to promote excess bias, it has to be said that the Thai Tai restaurant on the top floor of the nineteen story Royal Phuket city hotel offers great views of the city and the hills beyond. If for example you happen to be in the area (Phang Nga Rd, Phuket city) at around lunch time, then certainly this is a restaurant with a view. The cuisine (joint Thai/Chinese), by the way, is excellent. This is one of Phuket's most inspiring and famous vistas and landmarks, offering breathtaking sunsets and seaviews. It has been a prominent feature for mariners since the old days. Its tall cliff features a spectacular view of the neighbouring island Koh Gaew and also Nai Harn Beach. On the cliff are a few lines of palm trees, which run to the edge where the cape meets the emerald green sea. 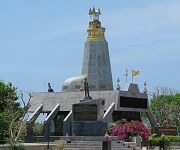 The Kanchanabhisek Lighthouse, on the cape, was built to commemorate the 50th anniversary of H.M. the King's ascension to the throne. At the top of the lighthouse visitors can see the magnificent view of the cape. Promthep Cape is 2km from Rawai Beach. It can also be reached from Naihan beach. Excellent views can also be seen from Ton Sai waterfall in the Khao Phra Thaeo National park. The Phra Puttamingmongkol Akenakkiri Buddha image will be completed in 2008 on 49 rai of land high up in the Nakkerd hills between Chalong and Kata. The Buddha will be 45 meters high and 25 meters across at the base. Apart from its philosophical significance, it is expected to become an icon for Phuket. The gold-painted image will be in the Maravichai style, and will face eastward, overlooking the sea towards Chalong. There are fantastic views over the east of the island from this site. During the rainy season in September and October the views can be rather restricted due to low cloud and mist. Directions: Proceed from Wat Chalong towards Chalong roundabout. At about the halfway stage there is a small (sign-posted) turning on the right which leads to the location. Access is by car, or motorcycle, all the way, but use caution especially when there is low cloud. Copyright © 2009 - KoPhuket.com. All Rights Reserved. Web site design and creation by KoPhuket DotCom. KoPhuket.com. All Rights Reserved. Web site design and creation by KoPhuket DotCom.